In his motivational sequel to Be Dynamic (Acts 1-12), best-selling author Warren Wiersbe skillfully explains the book of Acts to the layperson and the pastor alike. A respected pastor and a man whose study series has sold over 4 million copies, Wiersbe affectionately calls the apostle Luke "Dr. Luke" as he shows how Dr. Luke recorded Paul's missionary journeys. ^Readers travel through dungeon prisons, see the ancient world as if it were today, and witness the marvelous work God can do through a few souls fully surrendered to His purposes. They witness Paul's conversion and spot his imperfections, yet still they enter his successes as the Lord uses Him to preach Good News to the lost and dying. 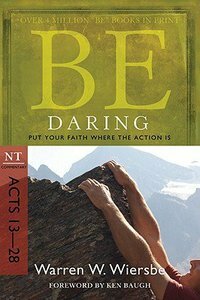 About "Be Daring (Acts 13-28) (Be Series)"
With over 4 million volumes in print, these timeless books have provided invaluable insight into the history, meaning, and context of virtually every book of the Bible. Revised with a new look and added content, these commentaries now include study questions at the end of each chapter for further reflection and application.